No matter the craving, guests can find it at Caribe Hilton. With nine dining options - ranging from classic Italian to fresh sushi, to prime steak to delectable sandwich creations – Caribe has the culinary spectrum covered. There’s also a range of scenery options to choose from - enjoy ocean views during any meal, take advantage of the swim-up snack bar at the pool, or relax in the comfort of private, spacious accommodations. Enjoy traditional northern Italian cuisine in the middle of the Caribbean at Il Giardino La Trattoria. 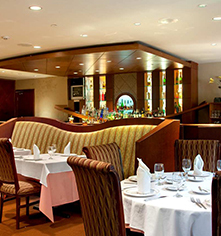 Serving more than a dozen types of pasta, fresh antipasto prepared daily, seafood, and more than 150 wines from famous vineyards throughout the world, this San Juan restaurant is a must for any foodie. Open for breakfast, lunch, and dinner. Breakfast, 6:30 a.m. – 11:00 a.m. Lunch, 12:00 p.m. – 3:00 p.m.
Dinner, 5:00 p.m. – 11:00 p.m. Guests can swim up to enjoy food and beverages from the Atlántico Pool Bar & Grill. Experience casual dining with endless ocean views complemented Dishes include a selection of fresh salads, wraps, sandwiches and classic grill options. Every night is special at Morton’s, San Juan’s premier steakhouse. Offering an elegant setting that includes stunning ocean views through floor-to-ceiling window, this legendary steakhouse features the finest in grain-fed beef shipped directly from Chicago. Guests can select from a wide range of delectable seafood entrees, vegetable dishes, irresistible desserts, and an award-winning wine list to complement their meal. Open daily for dinner. Monday to Saturday, 5:30 p.m. - 11:00 p.m.
Sunday, 5:00 p.m. - 10:00 p.m.
Monday to Sunday, 5:00 p.m. - 10:00 p.m. 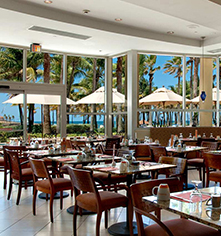 When it comes to San Juan restaurants, the place to go for breakfast with a view is the Palmeras Restaurant. Guests can start their day with a delectable buffet or an à la carte breakfast while overlooking a crystal blue Atlantic Ocean. Monday to Friday, 6:00 a.m. - 11:30 a.m.
Saturday & Sunday, 6:00 a.m. - 11:30 a.m.
For the adventuresome palate, Lemongrass Pan Asian Latino serves Asian-fusion delicacies from entrees ranging from ribs in hoisin-tamarind sauce to shrimp spring rolls with guava glaze. Lunch, 12:00 p.m. - 4:00 p.m.
Dinner, 5:30 p.m. - 10:30 p.m. The exciting destination bar and birthplace of the Piña Colada, Caribar, presents hand-crafted cocktails and a delicious tapas menu in an iconic setting, with panoramic ocean views, of course. Taste the evolution of the Piña Colada, from the original recipe that was created right here at the hotel in 1954 to global variations, including our contemporary version: The Clear Colada. Enjoy signature hot and cold beverages at the notable coffeehouse, along with an assortment of pastries and confections. A Starbucks Kiosk is also available in the beach area. Sunday to Thursday, 6:00 a.m. – 10:00 p.m.
Friday & Saturday, 6:00 a.m. – 11:30 p.m. Located at the beach area. Monday to Wednesday, 9:00 a.m. – 2:00 p.m.
Thursday to Sunday, 10:00 a.m. – 5:00 p.m. 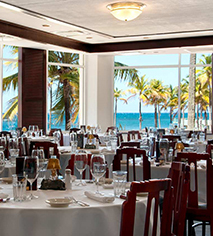 Experience a vibrancy and excitement unique to Puerto Rico at the Piña Colada Club. Try a selection of appetizers, salads, tacos and specialty dishes. Open for lunch and dinner. Monday to Sunday, 11:30 a.m. - 11:00 p.m.
Quiznos offers chef-inspired menu items, including grilled flatbreads, salads and wraps, savory soups, and toasty subs. Monday to Sunday, 6:00 a.m. – 10:00 p.m.
Order from a wide selection of appetizers, entrees, desserts, and drinks - all from the comfort of luxurious San Juan accommodations. Sunday to Thursday, 6:00 a.m. - 12:30 a.m.
Friday & Saturday, 6:00 a.m. – 2:30 a.m.